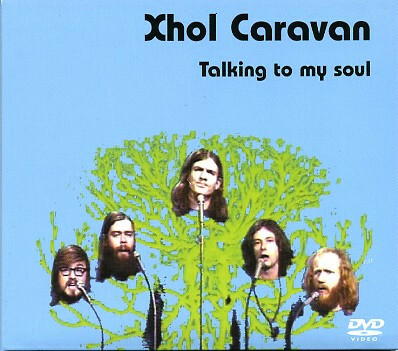 On the heels of releasing Electrip in the summer of 1969, the public TV station SWF offered to produce a show dedicated to Xhol Caravan, an offer they couldn’t refuse. So in 1970 SWF filmed four long pieces. However, over the years only portions of this show survived and are now presented on this DVD: “All Green” from Electrip; “Talking to My Soul,” part of the epic “Freedom Opera” from Altena 1969; and the unreleased “Oszillogramm.” Organist Öcki Brevern’s son is also seen playing a toy guitar. The overuse of psychedelic lights and camera techniques is very distracting, but the music is great, especially if you are a fan of their other studio and live releases. To round out the DVD, Garden of Delights included two additional videos of “All Green,” one recorded on January 17, 2003 and another on May 1, 2004, three months before saxophonist Tim Belbe passed away from lung cancer. These two reunion concerts feature both original members Tim Belbe and Hansi Fischer plus a number of younger musicians. In addition, Klaus Briest, the original bassist, joined them for the 2004 reunion concert. Unfortunately Öcki passed away in 1996 and his organ is sadly missing on these two videos, but over the 33 years since its first recording, “All Green” has grown and improved with new ideas and instrumentation. This is one of those music DVDs that is a joy to listen to but perhaps difficult to watch.